To evaluate the efficacy of the 7000 series and the Plasma BAR in reducing Influenza A (H1N1) virus. The 0.2 m3 acrylic test chamber was put into biological safety cabinet. The D5 device and fan were then placed in the test chamber. The virus suspensions were sprayed into the chamber using a compressor-type nebulizer NE-C16 (OMRON) into the test chamber for 5 minutes at an air flow ratio of approximately 0.2 mL/min. 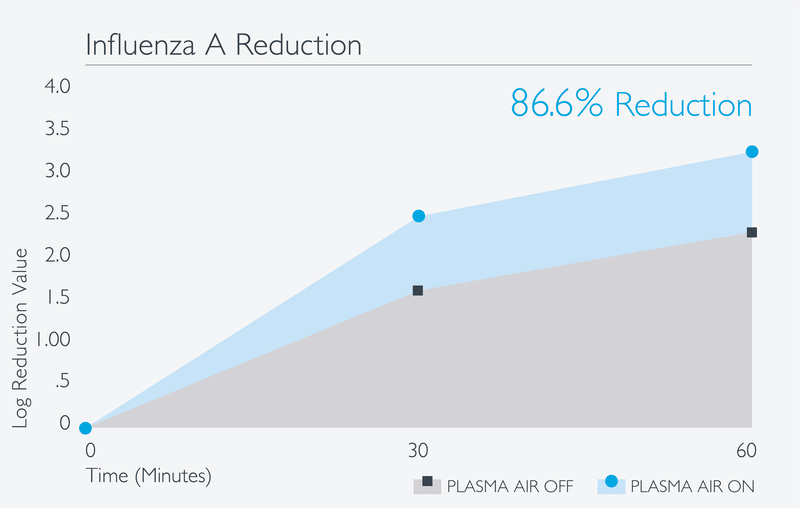 The device reduced 86.6% of Influenza A virus after one hour.